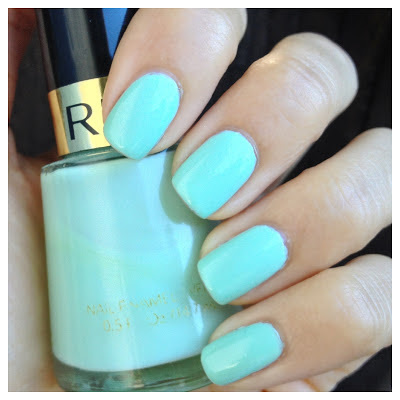 What I Blog About When I Blog About Books: NOTD: Revlon "Minted"
Today's notd is for my first mint polish ever, Revlon "Minted." It's a very standard mint polish. No blue tones. Cream finish. No grey tones. Not even close to a neon. The formula of this polish is somewhat streaky. It took me about 2-3 coats to reach opacity. The finish is what makes me dislike this polish. I don't know if this is just because this bottle is a few years old, but without any top coat the polish dries to a patchy matte, powdery finish. It's the strangest finish I've ever seen. Again, I don't know if that's just because my bottle is old. You will definitely need a top coat. It was very sunny when I took these photos, so be warned that this polish is not as bright in person as it is depicted below. I love mint polishes, I can't resist buying them! Maybe it's one of those soft touch ones? NOTD: Butter London "Molly Coddled"
NOTD: China Glaze "Peachy Keen"